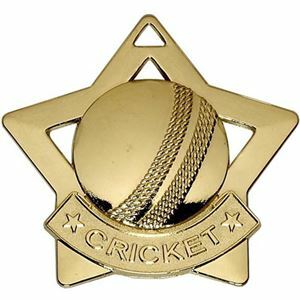 At Impact Trophies & Medals, we offer a fantastic selection of embossed medals for your cricket event or presentation. 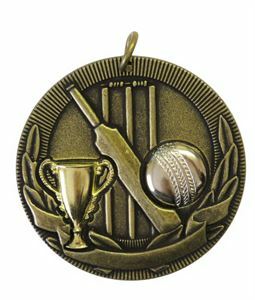 Included in our varied range are embossed cricket ball medals, star cricket medals and low cost cricket medal and ribbon combo deals. Impact Trophies & Medals are a leading retailer of embossed medals for cricketers. Great for personalisation, many of our embossed cricket medals come with a choice of coloured medal ribbons and optional printed text labels for the reverse of the medal, ensuring suitability whatever your cricket event. Embossed on the Super Value Cricket Medal is a cricket bat, cricket ball and stumps. The medal is further decorated with a chevron and grove pattern. Offers excellent value for money. 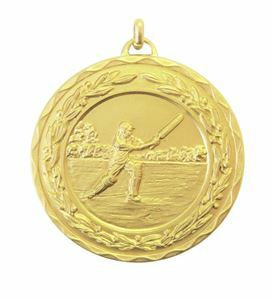 The Rectangular Cricket Medal is a modern rectangular shaped medal featuring an embossed cricketer in full kit. Available in a choice of gold, silver and copper finished, this modern 65mm tall medal with a cut out above the stumps. The Rectangular Cricket Medal has a loop in the rectangular frame to allow for easy assembly with clip on medal ribbons. Embossed on a backdrop of sun-rays, is a cricket bat and ball striking the stumps. The metal Target Cricket Medal is glazed with a brilliant shiny golden, silver or bronze lacquer. The beautifully embossed Laurel Economy Cricket Medal, shows an action batsman and has trees in the background. The metal medal has a laurel wreath surround. The intricate detail of the embossed cricket bat, ball and stumps on the Centurion Star Cricket Medal, is achieved by rendering the image in an antique gold, silver or bronze colouring and casting the medal from a premium grade zinc alloy. The medal has a star cutout to hook in the ribbon. 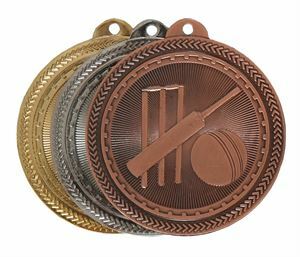 One of our best selling range of medals, the V-Tech Cricket Medal has a superior quality embossed image of two cricket bats, stumps and a ball. The striking medal is made from a high grade zinc alloy and has a cutout border which is ornately decorated with diamond shapes. The beautifully embossed Cup Design Cricket Medal, is three toned. The medal is cast in an antique metal colouring and has a shiny golden cup and silver cricket ball. Featured on this striking medal is a cricket bat and stumps which are decorated with a banner and laurel leaves. The contemporary embossed design of the Frosted Glacier Cricket Medal features a cricket bat, stumps and cricket ball. The metal medal is coated with a gleaming gold or silver glaze. 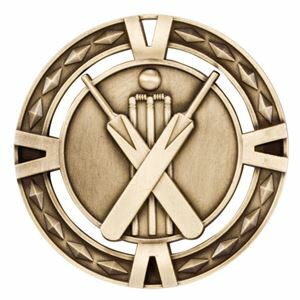 The High Relief Cricket Medal is a stunning embossed bronze metal medal available in a choice of 38mm or 56mm diameters. 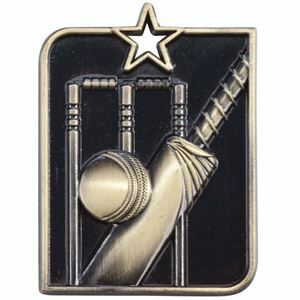 The medal is highly detailed and embossed with the image of a batsman and wicket keeper stood either side of the stumps. The medal is available in a choice of gold silver or bronze coloured finishes and comes with a loop at the top, for easy assembly with a clip on medal ribbon of your choice. 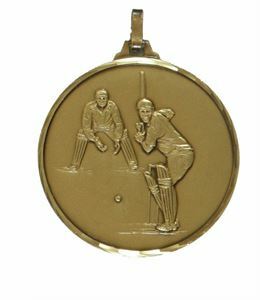 The High Relief Cricketers Medal is a superior quality cricket medal made from bronze. 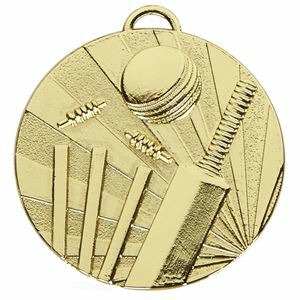 The medal is embossed with a cricket design featuring a batsman, bowler and fielders all playing in front of a large crowd. The medal is available in gold, silver or bronze coloured finishes and each has a loop at the top to allow for easy assembly with a huge choice of coloured medal ribbons.